Here we go again. This time it’s a completely playable Jedi Academy and it is better tested than Outcast was. I played at least half of the game. I guess there was 4 days of porting and 2 days of gaming (not all day long of course). A lot of Outcast porting code could be used for this version, so I was a lot faster this time around. If you just want to play the game without compiling anything, the binary files are located here: “code/Release/”. 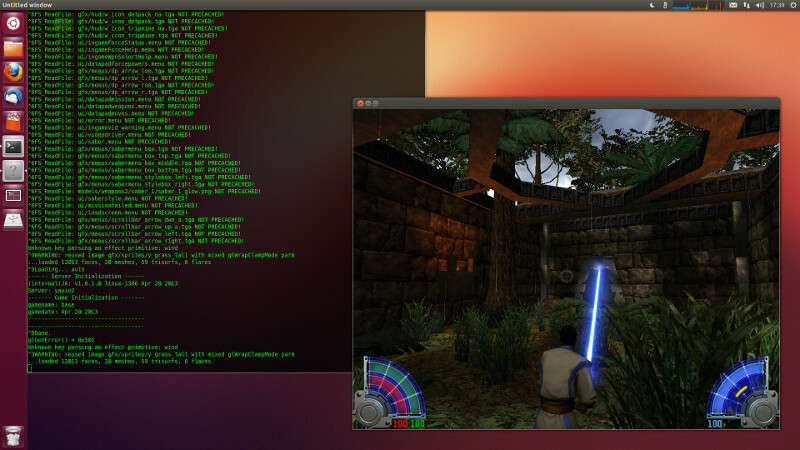 In order to start Jedi Academy, the “base” folder from your original game has to be copied into the folder of the Linux binary files. Be sure to mark “jasp” as executable and start the game with it. I used Code:Blocks as starting point for this port. The whole compile process is based on it, but I think it should be pretty easy to add Makefiles or other compiling structures. The source code is compiled with GCC. – I’m using a 64bit system, but this port is still a 32 bit program! This is the only thing I changed from the original code to improve the gaming experience. – if you want to play in your native monitor resolution you have to choose the following option “2048×1536”. I change this to the current resolution of the main monitor during OpenGL start up. This was a fast port, so don’t be surprised to see some bad hacks in place. The first goal was to get it to run. Making it better is the next step. I share the code now (in it’s current shape), because I know you want to play with it and maybe help out.